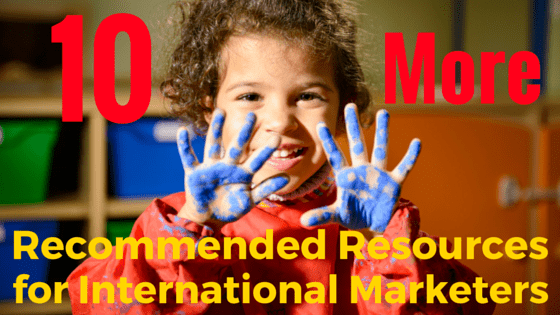 In a previous blog post, I listed 10 websites that I would recommend to any marketing professional or business owner who is looking for a more international perspective. Of course, that list was not meant to be exhaustive. So here are 10 more resources that I highly recommend and are definitely worth bookmarking. Headquartered in London, U.K., GlobalWebIndex is a market research firm founded in 2009. Touting itself as “The #1 resource for digital consumer insight”, it currently profiles consumers in 34 countries and 546 local regions around the world. Check out the Blog page, where selected findings from its recent studies are published Monday to Friday. Nielsen is one of the best known media research firms in the world. Based in New York, the company measures audience trends not only within the U.S., but also worldwide. The Global Insights category of their website is particularly helpful for anyone looking for international data, as it shares some of the latest findings from Nielsen’s own market research. Smartling, another New York based company, regularly publishes helpful articles on its blog. Topics range from translation and localization project management to global content strategy and software solutions. The Smartling Blog provides some great insights for anyone who wants a closer look at the nuts and bolts of the global marketing industry. “Putting the ‘World’ back into the World Wide Web”, this section of the website provides daily tech news from around the globe. Scroll down the page a bit to see all the most recent articles in reverse chronological order. Topics range from country-specific policy announcements to infrastructure projects, and from social media trends to the latest advances in mobile technology. Founded in 1963, the Boston Consulting Group (BCG) now has 82 offices in 46 countries, and is firmly established as one the the top management consulting firms in the world. The Global Advantage section of BCG’s Perspectives blog provides some in-depth commentary on international business topics and on particular foreign markets such as China and India. EcommerceWiki is a new initiative by the Ecommerce Foundation, a not-for-profit organization of national ecommerce associations from around the world. “Our ambition is to make the EcommerceWiki the international e-commerce handbook, which can help people with learning all about e-commerce, developing their skills and improving their business. The EcommerceWiki will be the “one-stop shop” for everything there is to know about e-commerce.” Check out the Reports section for e-commerce data from different parts of the world. Founded in 1996 and based in New York, eMarketer is a market research company that monitors over 4,000 global sources, organizes the data by subject and geography, and provides an analysis of the trends. Its stated mission is to be “the first place to look for information that will help you make better decisions about being more effective in a digital world”. Check out the Articles section, which is updated daily and provides lots of country-specific data. As the name indicates, this website focuses specifically on ecommerce in Europe. In a continent of 45 distinct countries, online retailers have their work cut out for them, accommodating different cultures, laws, regulations, consumer trends, currency and payment preferences. “We’ll try to keep all of you up-to-date with all the important European ecommerce news. Because Europe is a very vivid, varied and interesting region when it comes to ecommerce.” New articles are posted every week. Tech in Asia describes itself as “the go-to online platform for Asia’s tech community”. New articles are added on a daily basis and cover a wide variety of topics: the tech start-up scene, social-media trends, marketing campaigns, consumer insights, big business news, country-specific reports, and more. This website was created by Miguel (Migo) Roberg, a marketing professional who has been living and working in China for over five years. His blog contains many interesting articles on marketing in China and Asia. As an American living in Asia, he provides some very helpful insights into a market that still represents uncharted territory for many western businesses. Don’t have time to sort through all the latest articles? No problem. 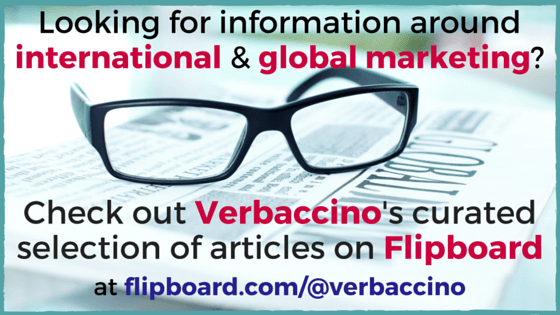 Just follow Verbaccino’s Flipboard magazine. It’s a curated selection of articles from these and other industry sources, and I update it several times a week. Are there any additional resources for international-minded marketers and entrepreneurs that you would like to recommend? Please share them in the comments section!